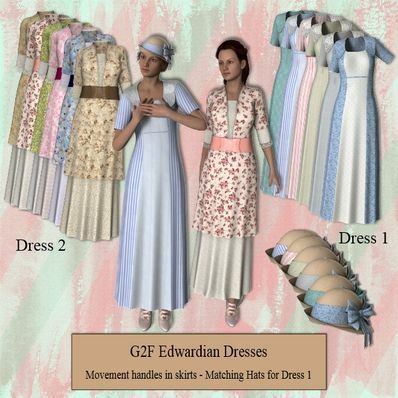 Edwardian Dresses for Genesis 2 Female for use in Daz Studio 4.6. Matching hat for dress 1. Thank you so much for making these available!! I am a fractal artist and I am brand new to DAZ and finding your website is a really wonderful thing. I hope I can figure out how to use them. And your website is clearly designed and the products easy to see at a glance. Well done! I have always loved this style. Thank you for sharing! Lovely dresses for the post-1909 "watershed" of the Edwardian era when the female silhouette in fashion changed so dramatically! I'd love it if you could work on some S-curve (1900-1909) dresses/gowns sometime soon. Beautiful creation - thank you! Your creations are so great. Thank you. Another terrific outfit, thank you. Very nice and thanks for these. The Hat is a really nice addition that gives it that extra period feel. Thank you! I think you are truly amazing, always creating these awesome outfits and then giving them away. Your generosity is greatly appreciated. New Year Greetings and thanks so much for sharing your wonderful creativity. really great! Thank you very much! Thank you yet again! Wonderful work! These are so lovely. The various textures sublime and the hats just the right extra touch. You are the BEST! Thank you. Wendy, this is a beautiful outfit - thank you so much! Awww! Really wonderful Dress! Thank you so much! Thank you for the beautiful dress. Era dresses are always welcome to my run time. Bravo! Bravo! Bravo! Thank you very much for these great dresses. These are very professional - & Nice. You are getting steadily better, Wendy; thank you. Thank you for so lovely dresses!